Made to function just like the original .45 Long Colt in looks, in performance and in style. The brass cased, lead flat nose and somewhat smoky powder hearken back to a time when you knew you were shooting a big bore gun and you had a purpose to all that shooting. 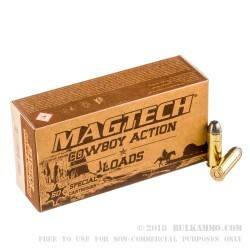 MagTech has dedicated quite a bit of resources to the Cowboy Action scene by implementing this “Cowboy Action Loads” line to their product portfolio. If the performance of the .45 Colt is any reference, then they will be a player int hat market for quite some time. It quite literally is built like the ammunition was built in the heyday of these special guns including the revolvers, lever guns and rifles that this ammunition performs so well in today. Suitable for consistent use in the replica firearms that are made to be near exact renditions of the old time firearms, this ammunition offers a good consistent load that won’t hurt the firearms by being overpowered, but is also no slouch of a round. 200 grains of solid lead coming out of your firearms at 705 feet per second muzzle velocity. 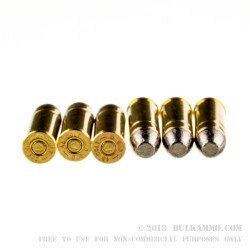 This load is suitable for use in any modern cowboy action firearm as well as those looking for a milder recoiling round for their other modern .45 Colt firearms. I have used this ammo in a converted Uberti 1847 Walker. RD conversion cylinder. 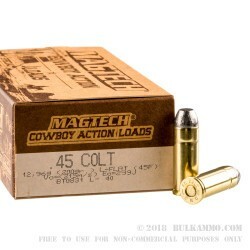 A: This 45 Long Colt is loaded from Magtech with smokeless powder. Additionally, all components used are non corrosive. 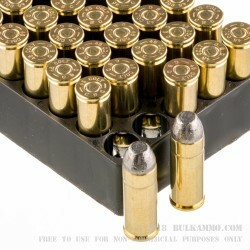 The spent brass may be saved for the reloading process if desired.